You’ve got the light you need, wherever you need it, automatically! No nails, screws or bolts are needed to install Quik-Brites™. Just peel and place for fast and easy installation. 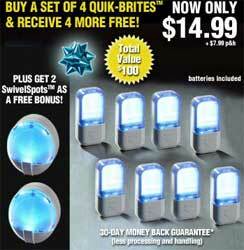 Quik-Brites™ LEDs are guaranteed for life! Quick-Brites™ are guaranteed to never burn out, or we’ll replace them for free for life, no questions asked!